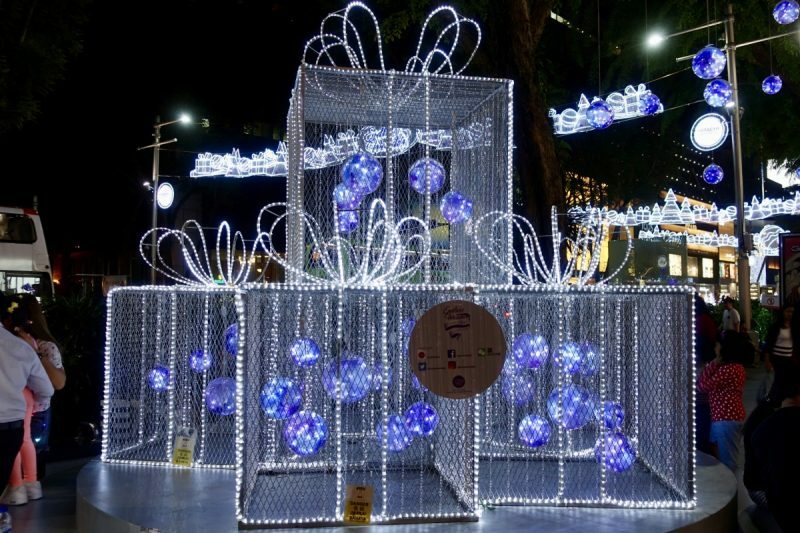 We visited Singapore early in January 2013 and noticed there were still a few Christmas lights decorating the Orchard Road precinct. 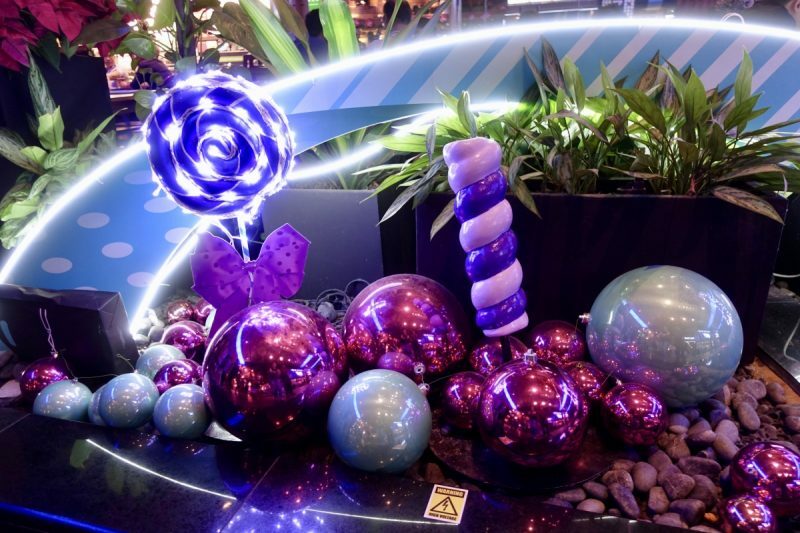 I did some research then and discovered Singapore puts on a huge display each year. 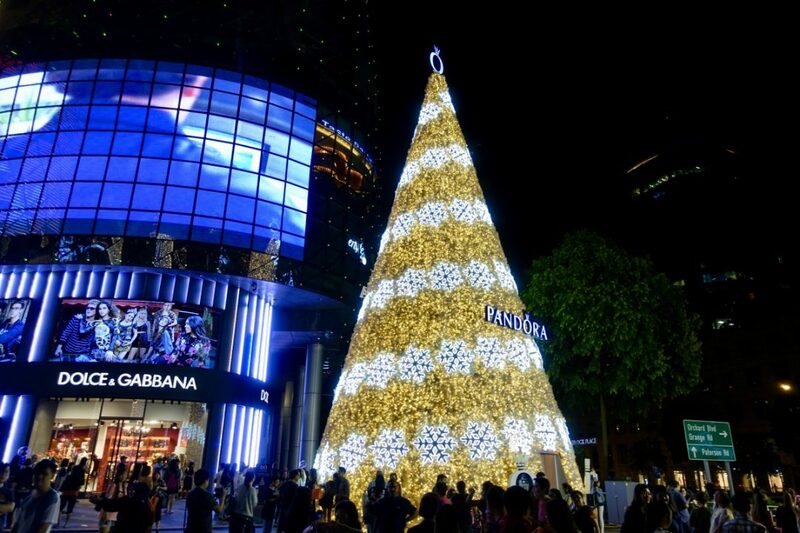 Ever since then I have been meaning to get back to Singapore in December to see the Christmas lights. Fast forward to November, when we were trying to work out where we were going to spend Christmas. 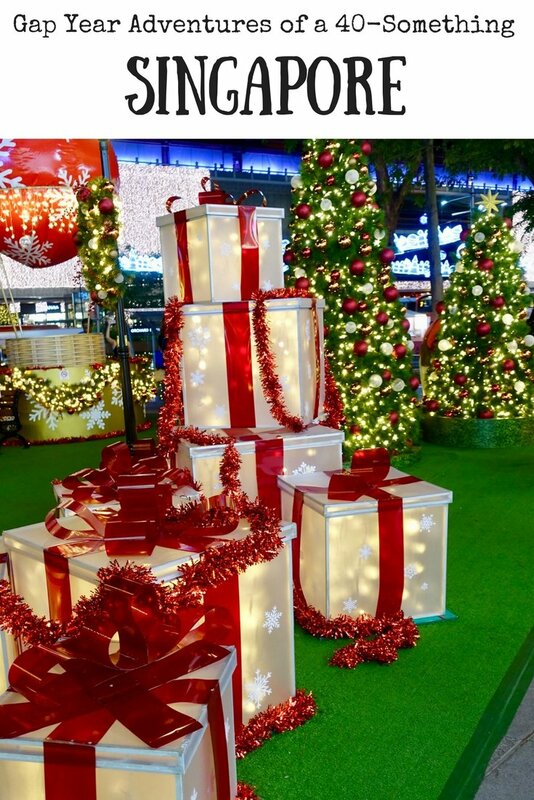 Someone suggested Singapore and mentioned the Christmas lights! I remembered that visit years ago. 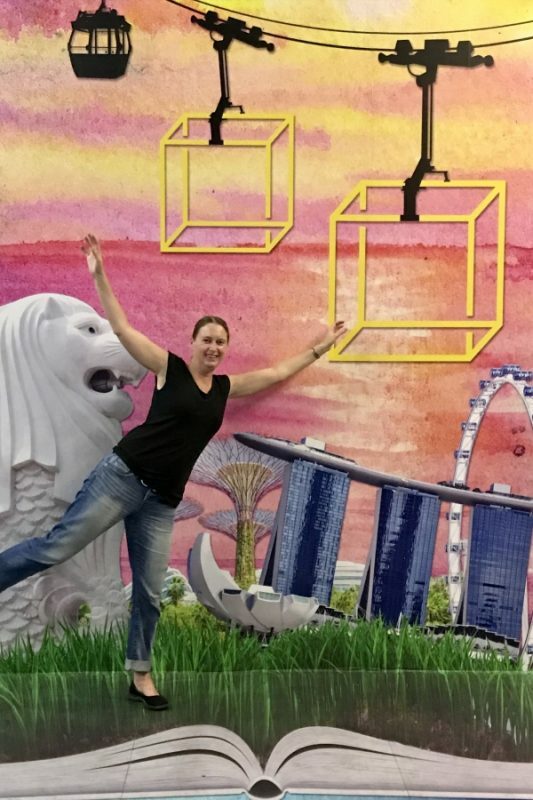 I didn’t really want to spend any time in Singapore because even though I love it, we have already been there once this trip and have three more nights booked on our way home to Australia. We were flying from Sri Lanka though into South East Asia, and the cheapest and most convenient flights happened to be through Singapore. 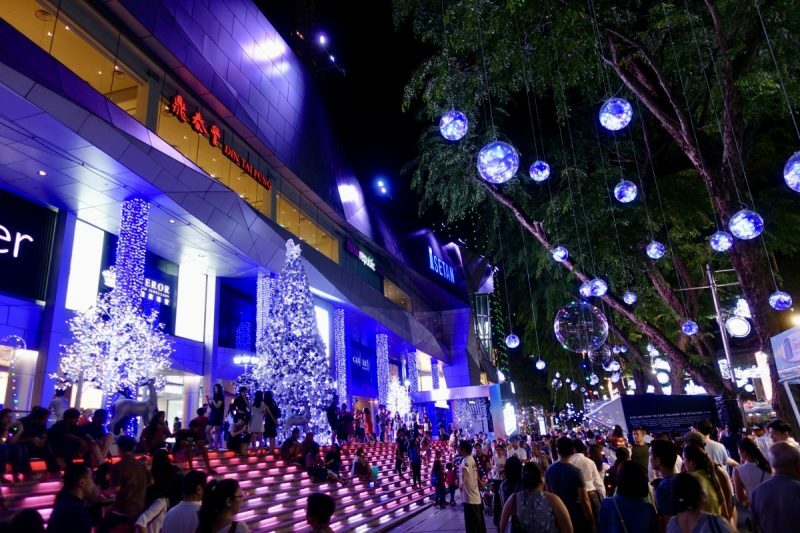 So we would make it an overnight stopover to tick those Christmas lights off the bucket list. 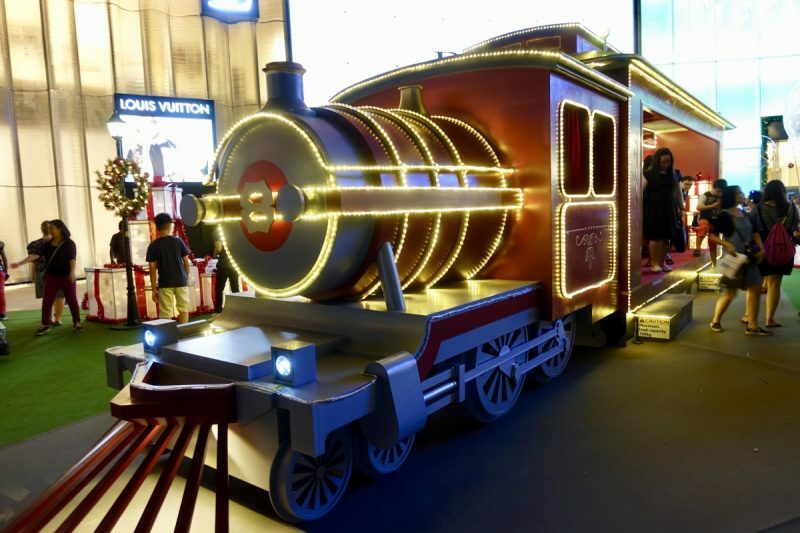 Our flight was running a little late, and by the time we made our way to our hotel and got checked in, it was 8:30pm as we jumped back on the MRT to make our way the three stops to Orchard Road. Our first task once we arrived was to get some food as we hadn’t yet had dinner. 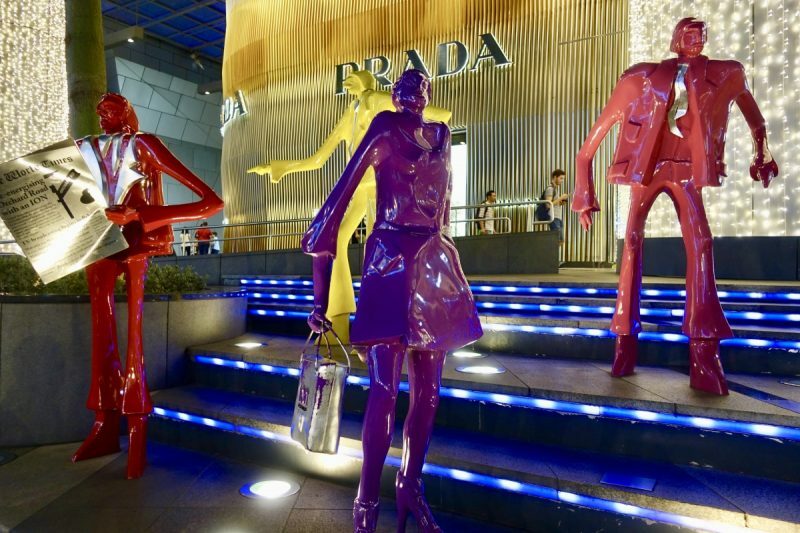 Orchard Road is a shopping strip with big shiny malls side by side along the street. 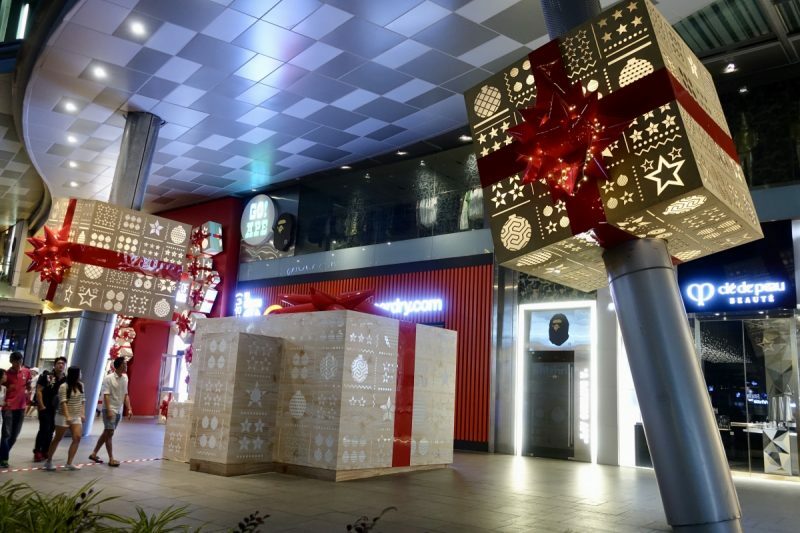 The area mostly caters to high end shoppers, so unfortunately no hawker stands here! Our solution in this situation is always to find the food court. There is always somewhere that the workers eat, but sometimes it can be a little hidden. 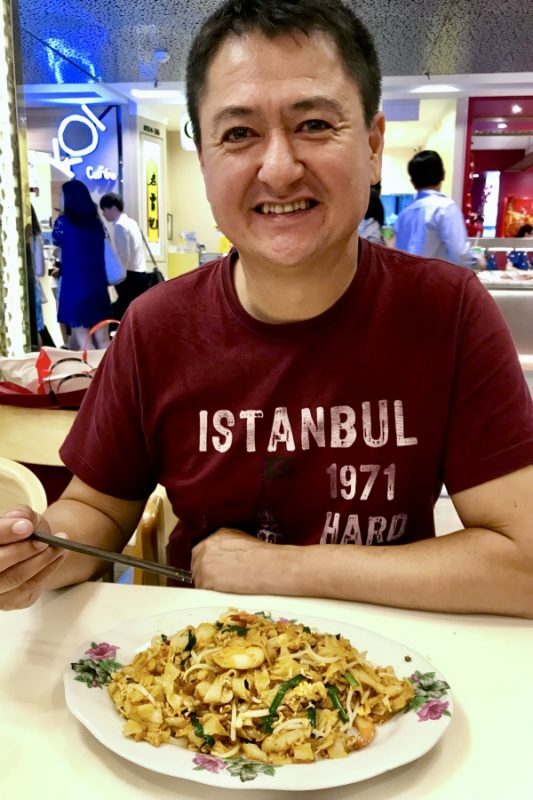 There was only one choice for our first meal back in South East Asia, and it had to be Simon’s favourite, Char Kway Teow. If you have never tried it, give it a go. It’s delicious flat noodles that are stir-fried with meats of your choice (usually pork, chicken or prawns) and some vegetables like onions and bean sprouts. Simon excited to finally have a big plate of noodles in front of him. With our stomach full, I finally got to walk from one end of the shopping strip to the other admiring the lights, the crowds, the carolers and the selfie-takers! 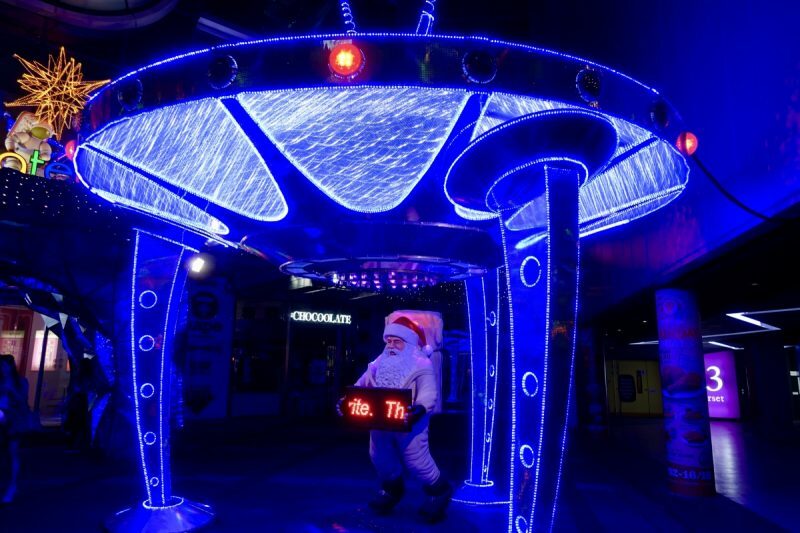 The decorations ranged from a huge Christmas tree sponsored by Pandora, to Santa with spacemen. There was a winter wonderland set up and a Christmas market too. 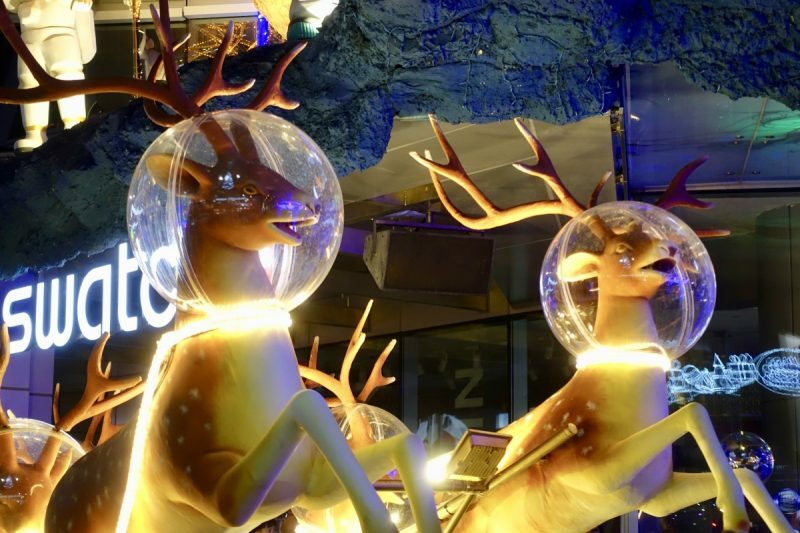 The trees hung with baubles and street sellers sold light-up balloons and Christmas snacks. 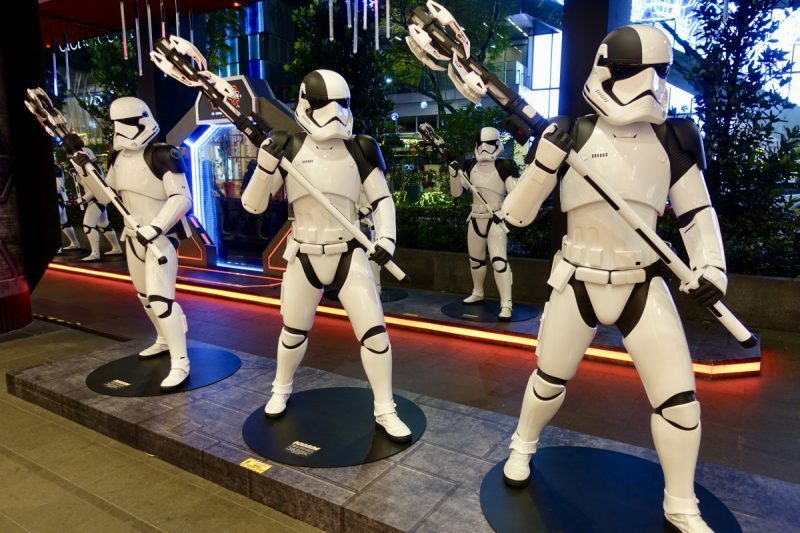 There was a huge Star Wars display with Storm Troopers lining the footpath, but that would be more due to the release of the lastest movie rather than Christmas. Some big boxes for big presents. A car maybe? We probably spent a good couple of hours looking around before starting the walk back to our hotel. 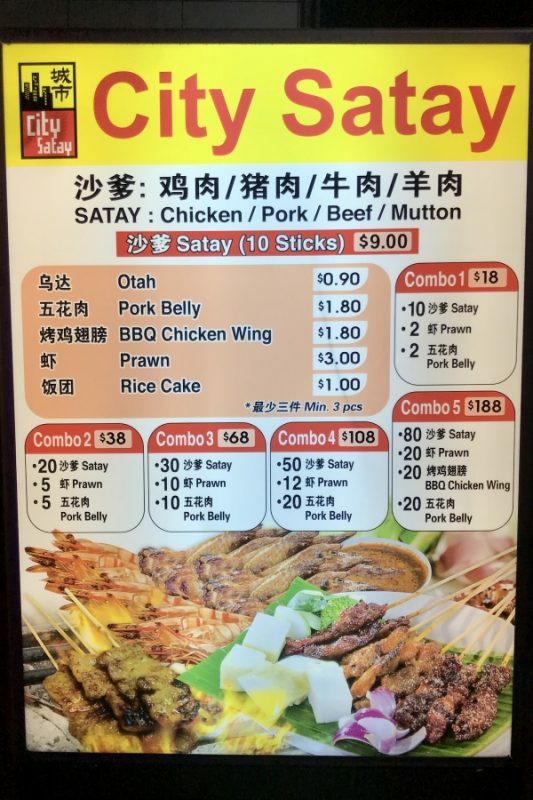 We didn’t get far though, as Simon spotted a sign – “City Satay”. His other favourite food are those tasty pieces of chicken on a stick doused in satay sauce that just don’t taste quite as good back home as here in SEA. I was still full from my noodles, but Simon happily ordered some satays and dug in. We had really missed our Chinese/Malaysian/Thai/Vietnamese food. With Simon’s Asian heritage and these foods being so common and available in Australia, we eat them a lot. We discovered that they were pretty much not available at all throughout Eastern Europe and the Middle East. I had been really looking forward to getting to this part of the world for the food. As we continued along Orchard Road we came across something like an Arts School. I wish I had taken more notice of exactly what the place was, because it had some of those cool pictures where if you stand in the right spot to take the photo it actually looks like the picture is in 3D. Simon and I had a lot of fun being silly as we posed in the scenes. High five! This one really does look like Simon is standing on a box! In the morning we enjoyed a lovely sleep in before meeting up with Simon’s cousin Tricia for brunch. 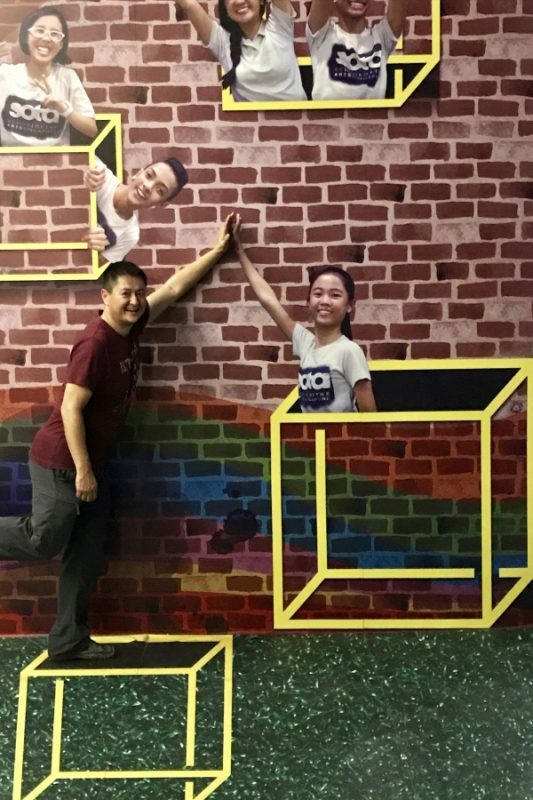 We have been trying to catch up with her in Singapore for years, but she has a job that involves her travelling a lot, and it has always worked out that she is out of town whenever we are there. It’s always enjoyable catching up and we are crossing our fingers than she will be around when we pass though again in April. And that was it, our visit over! We were back on the MRT on our way to the airport again. This time we were off to where we would spend Christmas. 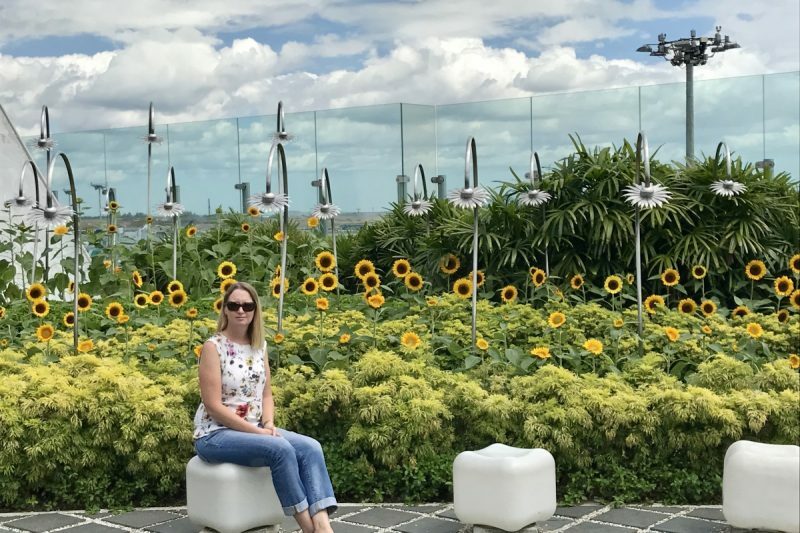 Hanging out in the sunflower garden at Changi T2 before our flight. There is always something to do in this airport. 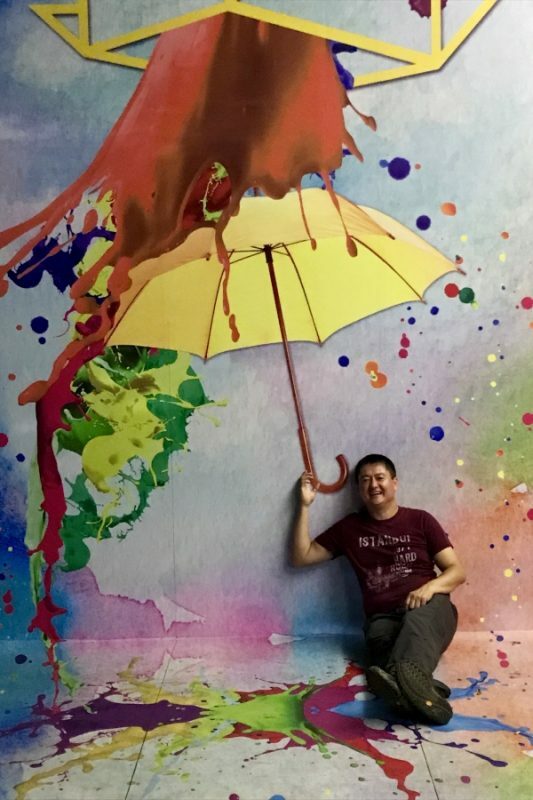 Want to read about our first visit to Singapore right at the start of our gap year? Click here to go to the post. Love those 3D pictures. Haven’t seen them before. And liked the look of Simon’s Noodles .. will definitely try the Seafood or Veggie version. You should be able to easily get them in Adelaide. The are sometimes called Fried Kway Teow too. I hope you like them.